Bending Vibrato Guitar Lesson: How Do I Vibrato String Bends? Vibrato can sound awesome on string bends and it’s a sound we hear all the killer rock and blues guitar players use in their solos! But how can you do it without the bend just, er…fizzling out completely when you vibrato it? 3 things you need to make your vibrato go from ‘so so’ to awesome ! 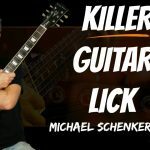 So dive in and find out how this technique can literally transform the sound of your licks and solos! Bending Vibrato Guitar Lesson – How Do I Add Vibrato To String Bends? 0:23 Hear a demo of what vibrato sounds like with string bends. Notice how it makes bends so much more expressive and energetic! If you’re getting a poor sounding string bend to start with…then no amount of vibrato will get it sounding good! Here we look at some key pointers for solid bending technique. I suggest putting your thumb firmly over the top of the neck when you bend and make sure you use the next door fingers to help push the string. This makes it easier to move it as well as providing much needed stability and strength. 1:41 Adding Vibrato to a Bend. To add vibrato to a bend you basically let the bend down a fraction then bend it back up to pitch. This takes a little control to get sounding good! Only let the string down a very small amount before bending it back up again. So that’s the mechanics of how it’s done. Now let’s look at some crucial tips you need to know about to get your vibrato on your bends sounding good. 2:15 Vibrato Tip 1- Make your vibrato sound rhythmic. Give your vibrato a rhythmic ‘pulse’ so it sounds musical, controlled and polished. Out of tune vibrato is not good! After you let the bend down make sure you bend it all the way back up again. If it’s ‘in between’ then it’ll sound like an out of tune bend…not good. Try to let the string bend down the same amount each time. This will make the tone and pitch of your bending vibrato consistent and smooth. If you’re doing this and making your vibrato rhythmic at the same time then you’re on your way to getting great vibrato and string bending technique. As you bend and vibrato you need to keep pressing the string ‘into’ the fingerboard of your guitar. If you release the pressure here then you’ll lose the sound and note. So it’s essential to keep a strong grip on the string even though you’re pushing it up and down. One of the best ways to practice your bending vibrato is to take a common scale like the minor pentatonic and practice adding vibrato to the most often used bends from the scale. I demo this using the A minor pentatonic scale. THEN JOIN THOUSANDS OF OTHER GUITAR PLAYERS IN MY FREE ONLINE COMMUNITY… AND GRAB A POWERPACK OF EXCLUSIVE ‘MEMBERS ONLY’ LESSONS!